Once again Canadian University Field Lacrosse’s top prize will be contested by the top two teams from the west division. The Brock Badgers’ thrilling 12-11 OT semi-final win over the Trent Excalibur has secured them a date with the Western Mustangs, 10-6 winners over the McGill Redmen, for the Baggataway Cup. The game can be watched live and free at www.lacrosse-tv.com at 1 p.m. Sunday. Brock is looking for revenge over Western, who beat them in the 2017 final 16-14. The Mustangs also beat Trent in the final in 2016, and will be looking for the three-peat this season. Brock has not won the title since 2009 after long period of dominance with 17 titles between 1986 and 2007. Against Trent, Brock was forced to overtime despite a dominant defensive performance. The Excalibur staged four comebacks over the course of the game but Cameron Parker was the hero for the Badgers, claiming victory with just five seconds left in overtime. The Badgers took an early 3-0 lead during a penalty-filled first half. Kurtis Woodland scored 59 seconds in with a low-to-high shot on an early man-up opportunity. Connor Brown put a floater over Austin Cairns at 4:24 as a flag was being thrown. Cairns made a great save on a long shot from Woodland with the Excalibur two men down, but Woodland converted Cree Blakely’s pass on their next opportunity. Jeff Fernandes stopped Brock’s run on the ensuing faceoff; Adam Perroni won the draw and passed to freshman long-pole Curtis Conley who found Fernandes on the left side. Woodland’s hat trick put the Badgers up 4-1 before Trent fought back with three in a row. Trent’s first man-up opportunity came after an extended possession in which the Badgers displayed excellent positioning, double-teaming every member of the Excalibur who got the ball. But the Excalibur broke through: Cole McWilliams started it off with a bounce shot, then Fernandes scored his second on an underhand shot. His third then came on a two-man up situation. 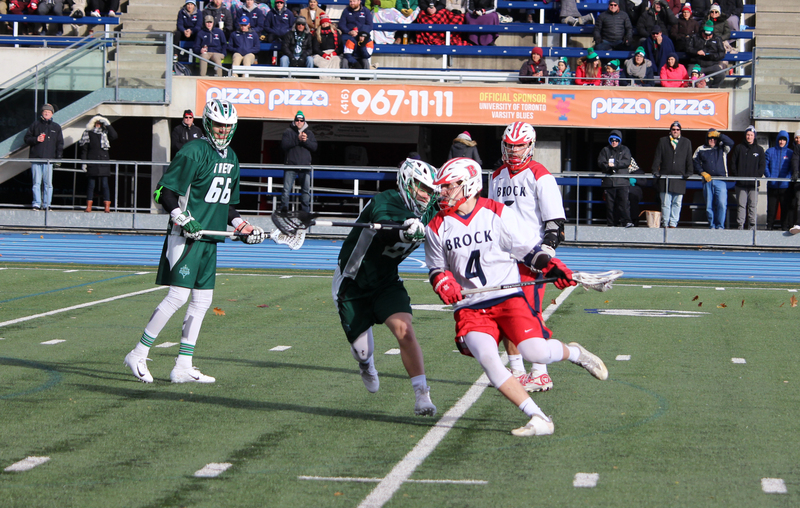 Brock outscored Trent 3-0 in the second quarter to lead 7-4 at the half. Trent’s only extended possession in the frame came with under two minutes to play. Their last shot rolled close to, but not over the goal line. The teams traded single goals in the third. Nick Chaykowsky skipped out from behind Brock’s net to close the gap but Grayson Houghton replied on a rebound. Brock led 8-5 after three. Trent turned up the heat in the final quarter and made a late push. Chaykowsky turned on the run to fire a shot past Badgers’ goalie Josh Wood. Jordan Gillis did reply for the Badgers as he battled a sudden burst of sunshine in the eyes on an otherwise cloudy and windy day, but Trent then rattled off three to tie the game at nine. McWilliams scored consecutive goals, first converting Perroni’s behind the net pass and then completing the dish from Fernandes as Fernandes ducked to avoid a check. Perroni’s individual effort with 2:30 left sent the game to overtime. Overtime consisted of two full four-minute periods. The first OT started much like the first quarter, with Woodland scoring on an early man-up opportunity. Cam Garlin pulled Trent back even with a goal from way out and the teams went to the second OT tied at 10. With 1:08 left, Tyrus Rehanek got in close on Cairns’ crease and threw a couple of fakes to get the goaltender moving. McWilliams then blasted a shot from the right side to again erase the deficit with just 24 seconds to play. Sudden death was looming, but some desperate play on the ensuing faceoff led to Trent’s Nick Finlay stripping Mitch Gustavsen of the ball, before Brock’s Latrell Harris then stripped Finlay. Connor Ham picked up the loose ball and passed it to Parker, who beat a defender to get in alone on Trent’s goal with five seconds left. 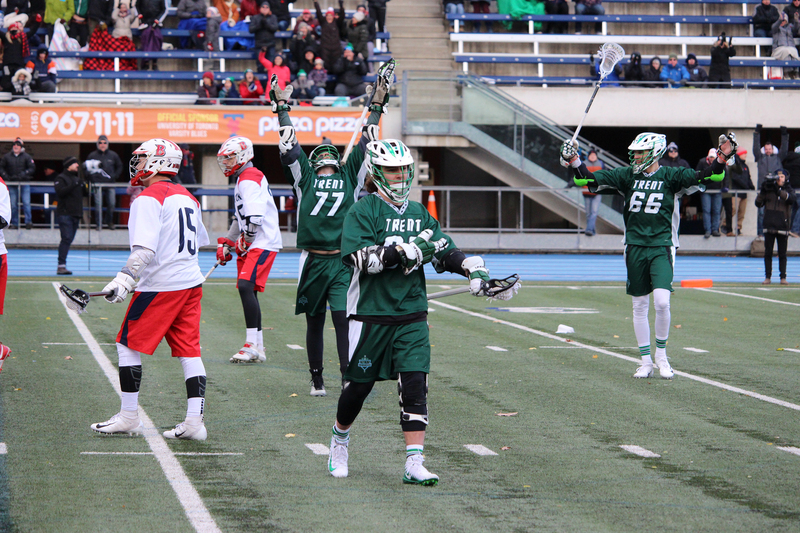 It was jubilation for Brock, who get another crack at dethroning Western, but heartbreak for a Trent program that’s worked very hard in recent years to become one of CUFLA’s elite’s teams. Woodland (5G) and McWilliams (4G/1A) were named the players of the game. Of the goalies, Cairns was forced to make 12 difficult stops while Woods stopped 11. Brock finished second in the west while Trent finished first in the east, although all four semi-finalists finished the regular season with 18 points. In the day’s second game, Cole Davis led Western with four goals while Cody Ward had three. Rowan Kelly scored twice and added two assists. Manraj Nijjar made six saves. Liam MacDonald led the Redmen with three goals while Andrew Chase scored twice. Michael Gallo made 10 saves.